When looking at the auto industry as a whole, there is perhaps no area more extensive than tires. Regardless of what you drive, what climate you drive in, what job you need to do, or anything that requires you to operate a vehicle, there are all sorts of tire options and levels of investment based on your requirements. As you could imagine, purchasing the right tire is not always a black and white decision. You need to start by understanding what your stipulations are, what type of driving experience you want, and what your price points are. From a general standpoint, there are eight major types of vehicle tires; each of which serves vastly different functions. But which is right for you and why? Let’s dive in. The all-season tire was originally dubbed in 1977 when Goodyear introduced the Tiempo. The idea behind this concept was to create a solution that would alleviate the hassle of having to switch out tires twice a year in the winter and summer months. All-season tires are constructed with special tread compounds and rubber that are meant to stay flexible in both hot and cold weather. The tread on these tires is engineered to give the vehicle stability on snowy roads, as well as push out water for traction and handling in a plethora of weather conditions. You might notice that many all-season tire models come with an M+S marking. The symbol stands for Mud + Snow which is based on standardized tire industry testing. Originally, this symbol was meant to differentiate knobby bias-ply tires from more common rib treads, of which were mainly used on light truck and radial car tires. As time went on, it became the standard marking to indicate that a tire has all-season capability. The name “all-season” certainly implies that these tires can be used year round. While this is true to an extent, it really depends on where you live. All-season tires typically work best in climates where the temperature stays above 45°F. Longer Tread Wear: All-season tires are engineered to provide a longer tread life than more specialized tires. For example, many drivers will see all-season tires last anywhere from two to three times longer than summer tires. Low Costs: When you get into specialized tires for certain seasons or applications, you are paying a great deal for cutting edge technology and designs. 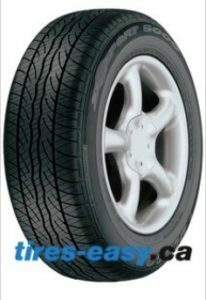 While all-season tires can certainly have similar innovative features, they are geared towards general purpose and typically have lower price points. Longer Warranty: To reiterate, all-season tires are built to have exceptional tread wear. In turn, many all-season models come with longer warranties than specialized tires. Smooth and Quiet Ride: Most specialized tire models are primarily built for traction in extreme conditions, certain terrains, or specific applications. Comfort on moderate roads is the primary criteria for how most all-season tires are designed. Not Ideal for Extreme Winter Conditions: In relatively cold weather with snow, rain, or ice, all-season tires will provide adequate handling. In light snow, all-season tires should be fine. However, in heavy snow and ice, it’s highly recommended to get specialized snow tires, especially in climates that are routinely exposed to extreme winter conditions. Not Ideal for Extreme Summer Conditions: If you live in a climate that experiences extreme heat, all-season tires will only provide a moderate level of traction. They don’t have the same soft, flexible tread compound that summer tires do to provide excellent handling on hot and rainy days. So, when looking at all-season tires, the strengths are also the weaknesses. In short, all-season tires work to be the “jack-of-all-trades.” However, as the saying goes: “a jack-of-all-trades is a master of none.” That being said, the drawbacks of all-season tires depend on where you are driving. If you periodically experience extreme weather conditions, all-season tires might not be the most ideal in those times of the year. StabilEdge Technology – This innovation is meant to enhance handling ability and dry tracking stability. It involves small bumpers placed within the tread blocks to keep the tread flat and open for maximum traction and precise agility. The Cooper CS5 Grand Touring is a very popular all-season model that uses this technology for improved traction during hard cornering, acceleration, and braking. The high-grade silica rubber offers longer tread wear that is effective in wet or dry conditions. Dynamic Range Technology – Tires with Dynamic Range Technology use a silica tread compound and asymmetric design meant to provide optimal grip on dry, wet, icy, and snowy road conditions. More specifically, this technology was created to have a stronger tolerance for extreme temperatures and deliver extra-long mileage durability for passenger vehicles. The Falken Sincera SN250 A/S is a smart all-season option that uses Dynamic Range Technology for a smooth and stable ride on all sorts of roads and conditions. This versatile tire is designed to remain flexible and grippy in extreme temperatures. Highway tires are meant to be used primarily on paved roads. They are strictly intended for commuting, typically come with long mileage warranties, and are designed for smooth, quiet rides with predictable handling on cars, trucks and SUVs. Most highway models feature independent tread blocks and multiple sipes around the tire for optimal on-road performance with traction in moderate weather conditions. Most come with the M + S symbol and are capable of providing all-season versatility. Longer Tread Wear: Highway tires are typically designed with special tread patterns that minimize noise and dissipate heat, which in turn, reduces tread wear for longer tire life. Enhanced Traction on Wet Roads: Most models are equipped with small siping grooves (often times in a wavy or zig-zag pattern) that channel water away quickly and enhance traction on wet roads. Good Fuel Economy: As the name implies, highway tires are designed for long commutes and performance on paved roads at high speeds. One of the primary characteristics of these models is to provide a smooth and quiet ride while maximizing fuel economy. This is especially advantageous for trucks and SUVs that typically get less mpg. Better Braking and Cornering: The less aggressive tread designs on highway tires deliver excellent braking and cornering compared to other tire types. Disadvantage On Wintery Conditions: While many highway models can handle wet roads and light snow, they are not designed with the tread patterns to handle heavy snow and/or ice. Poor Performance Off-Road: Due to the less aggressive tread patterns (meant solely for paved roads), highway tires may not provide optimal traction on dirt, gravel, sand, and mud. The Cooper Evolution Tour employs 3D Micro Gauge technology to extend the depth of the tire’s tread and encourage even wear throughout its lifespan. This line also uses a 5-rib tread pattern and wide lateral shoulder grooves to prevent hydroplaning. All-terrain tires are designed to have a high level of traction on all kinds of roads and surfaces. 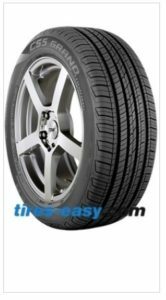 Models at fall under this type of tire have a combination of open-tread designed for both off-roading and handling on paved streets. The most important thing to keep in mind with all-terrain tires is they are meant for multiple purposes. So, if you only drive on paved roads and highways, this is not a good option. Year-Round Operability: As this type of tire is designed to handle tough conditions both on pavement and off, these models provide excellent traction in snow and ice, as well as on hot and rainy roads. However, it’s important to note that winter and summer tires will still have the advantage in the respective conditions. Reinforced Walls: You’ll find reinforced sidewalls on many all-terrain tire models. The main purpose is to increase the load carrying capacity on various road conditions. These models are great for heavier vehicles that see more off-road use. Open-Tread Design: Open tread patterns are what make all-terrain tires so effective on off-road surfaces. The versatile interlocking tread elements work to provide excellent grip on rocks and/or mud, as well as on paved roads. Loud Noise: Due to the tread design that is meant to maximize traction, all-terrain tires are going to make a much louder noise than tires designed for paved roads. All-terrain tires typically have symmetrical grooves that make the air passing through them give off a louder noise, especially on highways and touring streets. Shorter Tread Life: All-terrain tires are made with softer rubber that can be manipulated to provide adequate performance on a diverse range of surfaces. Unfortunately, the side effect is that the tread wears out quicker than other tire types. Poor Fuel Economy: When comparing all-terrain vs. highway tires, highway tires take the cake. All-terrain tires are designed for maximum traction, which in turn, decreases the fuel efficiency. However, as these tires are meant for both on and off-road driving, most models get better mileage than tires strictly made for off-roading. Pitch Sequencing – Pitch sequencing is used to randomize a tire’s road contact in an effort to reduce noise. Tire designers will sequence multi-pitch tread designs to subtly vary in both tread block size and shape. The circumferential block placement of the ribs is meant to align lateral grooves with adjacent tread blocks with the goal of varying the audible tones until the tires produce more of a pleasant white noise. models offer a refined tread element shape and pitch sequencing to improve performance while keeping the noise to a minimum. ain tires and seamlessly “adapt” to rocky and smooth surfaces in both hot and cold weather. The Cooper Discoverer AT3 Line uses high-level Adaptive Traction Technology designed for SUVs and light trucks. Cooper prides itself in the AT3 line being perfect for both the everyday commute and weekend adventures. The silica-based all-weather compound and all-terrain tread design give these tires a leg up in a wide range of temperatures and environments. Sport tires are used on high-performance light trucks, and are designed for excellent handling, performance, and of course, looks. Thanks to a larger contact patch area, sport tires provide excellent grip on dry paved roads. These tires are typically used with bigger rims and come with relatively low aspect ratios (profiles), which are 55% or less. 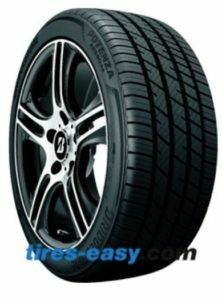 Sports tires are commonly associated with numbers like 225/55 (55 being the aspect ratio). This number shows the relation of the tire height to width in a percentage. For example, on a 225/75, the height of the tire would be 75% of 225 mm = 169 mm. Good Fuel Efficiency: As these tires are designed for paved roads, most models are created with fuel economy in mind. 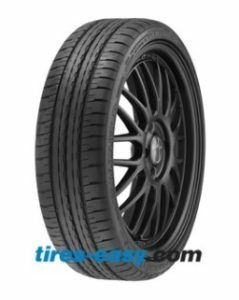 Improved Performance: The criteria for sport tires is that they give the vehicle a competitive edge when it comes to areas like cornering, braking, handling, etc. The wider contact patch area and stiffer sidewalls provide better lateral and cornering forces that are designed for high speeds. Awesome Looks: A tire meant to go on flashy sports cars needs to have a look that fits the part. Sport tires are created with appealing patterns to compliment the car they are used on. Prone to Damage: Sport tires are not meant to be used on rough roads. Hitting a pothole can potentially result in the rim cutting through the sidewall or causing wheel damage. Fast Wear: These tires are designed with softer compounds for better grip and traction, which also means they are more susceptible to wear. Rough Ride: Due to the short and stiff sidewalls, sport tires have less shock absorption – which can make the vehicle ride rough, especially on more damaged or unsmooth roads. Active Traction Siping – Patented by Dunlop, this system uses three unique types of sipes designed to pull, grip, and improve traction for superior cornering, handling, and braking. 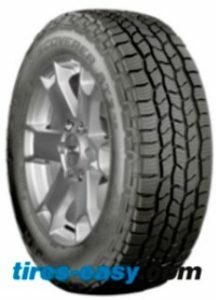 The Achilles ATR-K Economist is a sporty high-performance tire that boasts Active Traction Siping and a strong combination of style, performance, and comfort at an affordable price point. The deep grooves, multiple edges, and additional sipes give this tire excellent traction and grip all-year round – making it one of the most versatile sport tires on the road. Self-Supporting Technology – Another breakthrough from Dunlop, this technology uses a special sidewall construction that allows continued driving on a flat tire for up to 50 miles at up to 50mph in normal driving conditions. The Dunlop SP Sport 5000 is a trendy model that features the brand’s self-supporting technology for coupes, sporty sedans, and crossovers. This model is designed for high performance with all-season versatility on wet, dry, and mild wintery roads. While all-terrain tires are meant to provide a good driving experience in both on and off-road situations, mud tires, as you could imagine, are specifically designed as off-road tires. Mud tires can get the job done on everything from mud to rocky gravel to uneven sand dunes. 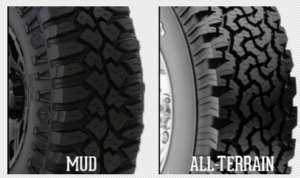 If you look at the comparison above, you’ll see that mud tires have larger tread blocks and gaps (void areas) than all-terrain tires. These are designed to clear mud and debris, as well as grip and release terrain more efficiently to create as much rubber-to-ground contact as possible for better traction. Extra Traction in Tough Conditions: Mud tires have deep ridges that help maintain traction on all sorts of treacherous roads. 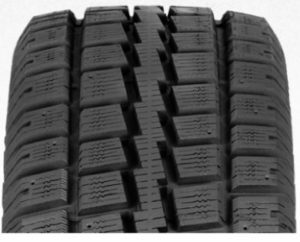 Cut, Chip, and Puncture Resistance: By default, the surface layer tread compound of mud tires must be very durable. Mud tires are designed to take punishment in off-road conditions and are highly resistant to cuts, chips and punctures. Multiple Ply Layer: Most mud tires are made with 3-ply sidewalls. In addition to added durability, the strong sidewall allows the tire to run on a low PSI to improve performance in off-road conditions. Loud Noise on Roads: Given the tread patterns and deeper void areas, the time spent driving on paved roads with mud tires will be very loud. Reduced Handling on Paved Roads: While the handling will be good on off-road paths (as intended), mud tires will not have the same effect on paved roads. 3D Canyon Sipe Technology – Characterized by deep tread grooves, 3D Canyon Sipe Technology is used to seamlessly eject mud, stones, or any sort of debris to ensure a vehicle can scale steep inclines and terrain of all sorts. 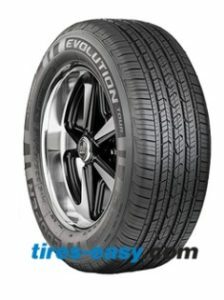 The Falken Wildpeak A/T3W uses this technology along with an array of versatile features. This tire model has earned the respect of truck, SUV, and Jeep owners everywhere. The sidewall pattern of this model provides an extremely high level of off-road traction and stability all year-round. The performance tires we know today were introduced to America in the early 1980’s when Goodyear fitted a number of high performance cars – namely the Corvette. Similar to sports tires, performance tires, also commonly referred to as summer tires, are designed to give drivers superior handling and traction on paved roads – both in wet and dry conditions. These types of tires are essential for those looking for an exhilarating driving experience and to operate their high-performance vehicle to the fullest capacity. Performance tires typically feature stiff, low profile sidewalls, large tread blocks, and nylon caps over the steel belts to keep the tire together while moving at high speeds. Better Handling: Performance tires give drivers stiff steering response and tight handling. The increased grip of these tires does a lot to improve cornering and most tread patterns are specifically designed for optimal control at high speeds on dry surface conditions. High Speed Rating: As these tires were originally built for racing, they can handle much higher speeds than regular passenger tires. Work Well with ABS: Being as how they are meant for superior handling, performance tires are designed to react well with modern anti-lock braking systems, as well as sensitive steering and suspension. Not Ideal for Hazardous Driving Conditions: Most high-performance models are primarily designed for dry road conditions and are not ideal for icy or snowy roads. Can Lose Grip When Pushed Beyond the Limits: When buying and using performance tires, drivers need to be aware of the speed rating and careful not to exceed it after an hour. If pushed too fast for too long, the tire can begin to lose traction and potentially result in a fatal accident. Ultra High Performance, All-Season Capability – A common stigma surrounding performance tires is they only work well in dry conditions. While the goal of many tire companies has been to change this perception, Bridgestone recently unveiled a design that goes the extra mile (pun intended). Following Bridgestone’s lead, many tire brands are now pushing to make their high performance tires to have all-season capability. Bridgestone’s Potenza RE980AS is a performance model that features a unique tread design that allows the tire to quickly expel water and grip to snowy roads while significantly reducing the risk of hydroplaning. Additionally, the tread is asymmetric and employs 3D, full-depth siping to increase the rubber’s flexibility in colder temperatures. As the name implies, snow/winter tires are specifically designed to handle cold weather conditions ranging from heavy snowfall to black ice. These tires can be characterized by the flexible tread rubber that remains soft in lower temperatures, which creates better grip on slippery roads. The tread depth and unique patterns on winter tires are designed to help push out snow and water for better traction. Another key characteristic of snow/winter tires is biting edges for extra traction on icy roads. For the best results, snow/winter tires should ONLY be used in areas where temperatures regularly dip below freezing. Improved Grip: When you have to drive in heavy snow or ice, the core purpose of snow/winter tires is to give you better grip. 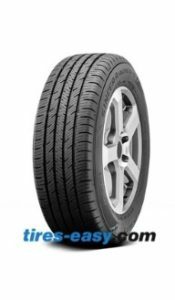 These tires are designed with soft rubber and have deep treads for the best possible traction. Some models come with studs for enhanced grip in extreme weather conditions. Better Braking: On slick winter roads, braking is everything. Unlike all-season tires, of which can easily lock up and skid on slippery surfaces, the tread on snow/winter tires digs into snow and ice to ensure you can stop quickly if needed. Winter Tires with Studs Can Damage the Roads: Inferior Handling: Due to the design, snow/winter tires offer less precise handling on dry or mild wintery roads than their all-season counterparts. Fragile: Being as how snow/winter tires are built with softer rubber than regular tires, they tend to wear down faster. That said, driving with snow tires in conditions that don’t warrant them can deplete the treads and grip very quickly. Snow Groove Technology – This technology uses a high silica tread compound and patterns designed to provide the best possible grip on snow, black ice, and any other harsh winter conditions. Snow Groove Technology gives tires strong, biting edges to enhance traction and winter performance. 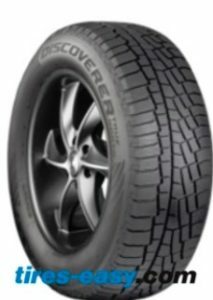 The Cooper Discoverer M+S is a high grade, studded winter/snow tire that uses Snow Groove Technology in the design. In addition, the saw-tooth center rib and block tread provides a great deal of extra stability and even wear. Snow Trapping Technology – The tread that includes this technology is designed to lock snow in place upon the initial contact. The purpose is to improve grip through snow-on-snow traction. The Cooper Discoverer True North line employs Snow Trapping Technology for passenger vehicles that are faced with the most extreme winter conditions. These tire models are compounded with noise dampening structures to ensure a quiet ride, no matter what. Truck/SUV tires come in all shapes and sizes. As the name implies, these tires are meant to fit passenger trucks and SUVs to handle a variety of different tasks. For those who need to pull heavy loads or a trailer, a light truck tire might be the best choice. 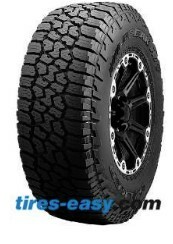 For off-road enthusiasts, all-terrain or mud truck/SUV tires would be the ideal solution. 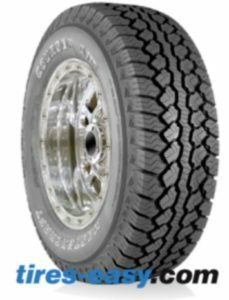 Nearly every type of seasonal and/or terrain tire can work on a truck or SUV, depending on what the need and intended use is. More Ground Clearance: For off-roading, many drivers will elect to choose larger-sized truck/SUV tires for added clearance on rocky terrain. Larger tires protect against obstacles that can potentially damage the engine or chassis components. Better Traction: Since truck/SUV tires have more mass than those of smaller vehicles, they make more contact with the road. Improved Wet Performance: Regardless of what type of truck/SUV tire you have, a HUGE benefit is that these tires perform very well on wet roads and do a lot to prevent hydroplaning, especially wider models. In general, truck/SUV tires have larger tread blocks and water channels to improve contact. Added Strain on Brakes: When you are driving with an upsized tire, it takes more power to come to a stop. Even with moderately sized truck/SUV tires, brake pads tend to wear down quickly. Upsized Tires Increase Fuel Consumption: Upsized all-terrain and mud truck/SUV tires carry a lot more weight than regular truck tires. If you’ve upsized your truck/SUV tires, the result is that the engine has to work harder and burn more fuel. Advanced Reactive Contour Technology – This technology is designed to enable the contour of the tire to react appropriately to different road conditions. The purpose is to help improve tread wear and contact throughout the lifetime of the tire. The General Grabber is among the best high performance truck tires on the market. 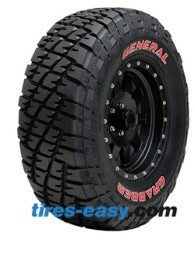 The General Grabber is an all-terrain tire line built for traction in the most extreme conditions. It uses Advanced Reactive Contour technology to make the tire extra versatile while ensuring an even tread wear. Choosing tires is not always easy. The most important thing is that you have (at the very least) a basic understanding of your driving needs and why certain tires are better than others. Having a knowledge of which tires work well in certain situations can not only improve your vehicle’s performance, it can save you money and frustration in the long run. A good rule to live by is that you should always invest heavily and wisely in the things that come between you and the ground.